Guest Editorial: Are we ready for ‘Vision Zero’? No loss of life is acceptable. The Vision Zero approach has proven highly successful. It is based on the simple fact that we are human and make mistakes. The road system needs to keep us moving. But it must also be designed to protect us at every turn. But in practice, we’re far away from Vision Zero, both in tone and in numbers. There’s still an immense focus on personal responsibility by vulnerable road users: Mr. Tell said “Be visible”. Captain Wyatt spoke about how people riding should wear helmets, and blamed most crashes with walkers on the people walking. And the streets are still not safe. In the U.S. in 2008, almost 4,400 people were killed and 69,000 injured while walking. Right here in Portland, on 82nd Avenue (one of ten high-crash corridors identified in a recent study), detailed investigation showed there was a crash more than once a day from 1997 to 2006. Forty-five percent of those crashes involved injuries or death (See PDF of 82nd Avenue High Crash Corridor Report). Bret Lewis was killed last week. The measures suggested to improve the situation on 82nd included measures as lackluster as “Consider conducting a vehicle speed study.” “Increase enforcement at specific focus areas as staffing allows.” Funding is available for “Develop a letter campaign targeting businesses/property owners to maintain sidewalks, plants, etc.” but not for installing 2038 ft (about 0.4 mi) of sidewalks that would help pedestrians walk safely away from vehicle traffic. Is safety our #1 priority? As long as we’re looking at a system whose responses to injury and death are “Consider” and “if funding allows”, I don’t think we can say that truthfully. Safety is an afterthought in a system designed “to achieve the efficient, free, and rapid flow of traffic”. When did the Institute of Transportation Engineers (ITE) lose their devotion to the second half of their mission: “Yet, at the same time, to prevent traffic accidents and casualties”? before PBOT installed a bike box. And what’s the difference between the ITE mission and Vision Zero’s mission? Not a lot, on the surface; but both the order and the language are telling. 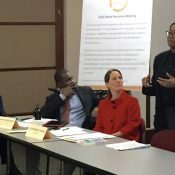 Vision Zero starts by saying that no loss of life is acceptable, then acknowledges that the purpose of a transportation system is to enable our movement and says that the way to do this safely is to place the responsibility of protecting users on the system, acknowledging that human error is inevitable. In contrast, the ITE mission speaks of rapid traffic flow first, and preventing casualties and “accidents” later. They don’t focus on the fact that errors are inevitable, but somehow believe that they can be eliminated. And American traffic engineers follow that order. They focus on optimizing traffic flow and measure their success in vehicle throughput and ‘Level of Service’. We don’t have a corresponding focus on measuring and optimizing safety, so we don’t have corresponding levels of safety. Instead, we examine the system after the fact to see where the safety is notably lacking, and try to fix things up. People die and are injured to show the rest of us that there are serious safety issues with our road system. Some might say we have to start where we are. I’d agree. Let’s do that by acknowledging that safety is not currently the #1 priority of Portland’s road network. Movement is. Until we decide to change that at a systematic level, there won’t be “true choice” on Portland’s roads, for anyone, including the people getting behind the wheel of a car. As Captain Wyatt said, no one gets in their car intending to kill someone — but our road network is designed so that a moment’s inattention makes that possible. Sweden’s Vision Zero is leading the way out of that. Are we ready to follow? Unless something is done at that location to improve conditions for people trying to cross, or to completly prevent them from being able to cross there, I predict that Bret will not be the last vulnerable user of the road killed in that location. 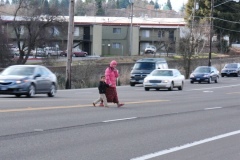 that a pedestrian is crossing. to a driver in a second lane. puts them in a dangerous situation. out of parking spaces in parking lots. who take extra time to cross the street. That does not make it safe or responsible. The whole concept of “jaywalking” only came into existence after the automobile had won the battle for the streets, circa 1930. Prior to that, people had the right to use the entire street as they saw fit, and those in cars had the responsibility to maneuver around them. This responsibility was felt to be too much a hindrance on “efficiency”, so people on foot were restricted to certain portions of the road. Thus, jaywalking. They might be jaywalking, but it’s probably not illegal. 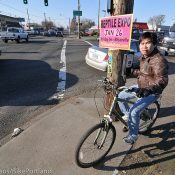 Some time back here on bikeportland the question of the legality of jaywaking came up. A reader did some digging around, and found that in Portland, mid-block crossings are illegal if they’re within…I think it was 100′ of a crosswalk (I’m vague on this.). Portland’s blocks are 200′, so you’d be fine crossing there, exactly mid-block. People are saying the pic of the woman and child is showing a location on TV highway near Tuallaway Ave, which is Beaverton. That would be about a thousand feet from the nearest crosswalk, which is signaled. People on foot, and living around there got to get across the road somehow. Does society really want to say to them ‘You can live here, but you’re on your own getting across the safely on what is many was a freeway.’? “… Does society really want to say to them ‘You can live here, but you’re on your own getting safely across what is in many ways, a freeway.’ “. good work, alexis, thank you. note to jonathan: the cutline under the third photo suggests that the green box might have prevented the crash. unless this crash occurred immediately after the signal changed from red to green, i would suggest that the green box would have had zero effect, and/or could contribute to the problem by reinforcing the idea that a cyclist should ride to the right of motor traffic on this section of couch. I think you are reading into that caption because you have strong personal opinions about that specific issue. 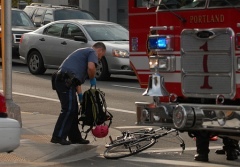 I’m merely stating that a crash occurred at a location that PBOT knew was dangerous, so much so that they had identified it for a bike box — which they installed shortly thereafter. and i am saying that if PBoT was focused on vision zero they would not be putting up this window dressing which does more harm than good. 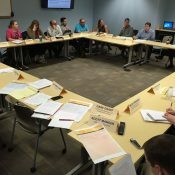 Only a tiny bit OT: Interesting article in Feb 2011 Outside, on the psychological dimension of cycling safety http://tinyurl.com/4ohydw9 Extended discussion of Portland’s efforts. I love the skepticism, Alexis, but I’m skeptical in turn of Vision Zero. Do we really want safety to be our top priority? Aren’t there some things in life more important than extending it? Should we ban dishwashers because people stick upward-facing knives in them? If not, and part of “acknowledging human error” includes “accepting small levels of danger,” then isn’t the “Vision Zero” language deceptive? Or does this only apply to transportation? In which case, how can we justify devoting more public resources to transportation while letting people die (or acquire lifelong disability) for lack of preventative health care? I want to be safer on the streets than I am — no question. But safety has to be weighed against other considerations, doesn’t it? i am with alexis on this one, michael, though i did enjoy the link to the mail, with the sidebar celebrity gossip, and the weird backstory on the incident with the knives. there are other reasons to get rid of automatic dishwashers, and oddly it does link up to vision zero. how have we let the built environment become so unfriendly to pedestrians and bicyclists (and children and kittens)? “progress.” maybe we do need to reset our priorities. not eternal life, okay, but is road carnage how we want to limit population growth? The difference between the dishwasher incident and traffic on public roadways is the public factor. I know and trust myself and those in my household to not leave knives lying around in dangerous places. For my own safety, I can only trust every other road user as if they are the least responsible road user out there. To oddly quote Tommy Lee Jones from Men In Black, “A person is smart. People are dumb, panicky dangerous animals and you know it.” Let’s have some of those smart persons design a system to move people, taking into full consideration that those people are dangerous animals. And lets hold those smart people accountable for their work. There’s no such thing as an unpreventable traffic death. If Vision Zero becomes the DOT’s mission statement then any traffic death is a failure by the DOT. The question on hand is about design priorities. Right now the big dead deer in the middle of the table that everyone wants to ignore is the fact that the only design intention for our infrastructure is minimizing cost while maximizing speed with which we get objects from point A to point B. The thing is that when it comes to our engineered landscape, of course safety ought to be the first and primary concern when faced with a reality of the stunning level of carnage on our currently ridiculously designed infrastructure. Functionality is the ultimate measure of good design, and I’d argue that absolute safety is an absolute requirement to good functionality. It’s not that safety necessarily has to compromise any other element — it just has to be considered equally with the other factors. There is a story that safety is expensive or that safety means slowing down getting objects from point A to point B. This is where good design comes into play — and good design should mean design without compromises. That’s about right. Safety is and should be a top priority in transportation infrastructure concept, design and realization, but not the only one. To be successful, what’s built, in addition to being safe, has got to work. What we’ve got today, with hundreds and thousands of motor vehicles zooming at high speeds alongside pedestrians trying to make their way down 4 foot wide sidewalks, doesn’t exactly work. It isn’t particularly safe either. Well sure…it can be done and is done, but the hazards are all too apparent, like the worst part about going kayaking in a crocodile populated river. As a result, millions of Americans have not been persuaded to go there. Part of the problem with current engineering standards is that there are plenty of measures applied to optimize the movement of motorized vehicles (level of service, delay, out of direction travel required, volume to capacity ratios, etc. ), but no similar measures exist or are used for optimizing bicycle or foot traffic. As a result, traffic signals are located and timed to optimize motorized vehicles. Bicyclists and pedestrians just have to put up with what they’re given (and are told to dress in bright colors, wear helmets, etc.). That makes bike/ped travel more difficult and more dangerous, and also creates the “they don’t belong on the road so it’s their own fault if they get hurt” mentality. Once we start creating and applying real engineering standards to bike/ped travel, we might start to find solutions. For example, I would assume that the woman and boy in the picture are crossing TV Hwy at that point because the out-of-direction travel required to walk to a signalized crossing, plus the delay they’d face while waiting for the “walk” sign (I doubt the nearest signal is optimized for pedestrians), plus the danger they’d face from turning traffic even when given the “walk” signal all make it worth the risk to cross where they’re crossing. After all, lots of pedestrians are killed in crosswalks, too. Even though some of our streets have bike lanes and sidewalks, our traffic engineering mantra is to keep motorized vehicles moving. Yes, engineering standards need to optimize safety first, but there also must be standards that put the optimization of bike/ped traffic at the same priority level as the optimization of motorized vehicle traffic. Once all traffic is treated with equal respect, then we might be able to start moving towards safety. This is where I got my numbers for the crashes on 82nd. This shows the intersection and corridor crash data from the City that led to the high-crash corridor designation. Michael – It was Mayor Adams who suggested that safety not only should be, but indeed *is*, Portland’s #1 priority. My musings are more about what it would be mean for that to be true. What’s optimal safety? What does it mean to prioritize it, and are we ready to do what’s necessary to do that? I’m also disappointed in your rhetorical use of false dichotomy with healthcare and the assumptions behind it. Doing transportation better does not intrinsically mean doing healthcare or anything else the same or worse. There’s no intrinsic connection. (Though we might incidentally do healthcare better, in that we wouldn’t need to devote as many resources to treating people injured in transportation-related crashes.) 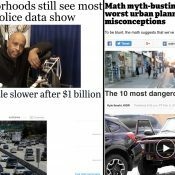 Nor does Vision Zero necessarily mean devoting more money to the transportation system; it may simply mean allocating the money we use in a different way. I believe that a safer society is a healthier society. -Couldn’t have said it better. Alexis (and Vladislav) I haven’t read much of the Vision Zero literature so I may be misinterpreting it. But how many ways are there to interpret the phrase “no loss of life is acceptable“? Let alone the brand name “Vision Zero”? My interpretation of this matches Vladislav’s language above: “absolute safety.” This isn’t the same as optimal safety! To use an extreme example, a safety absolutist would say that making something 1% less deadly is worth doubling the cost of a project. You say that making transportation better is unrelated to making healthcare better. I don’t agree at all. Our society has a limited amount of aggregate wealth that can be used to solve its problems. If, for example, a certain transportation policy were to reduce our GDP by 0.1 percent nationally, that’d be 15 billion dollars a year that couldn’t be spent on things like fixing rotator cuffs. I’m not saying that bike-safety improvements (for example) are a bad use of our money. I’m saying that if we were to spend enough on them, eventually they would be. This view seems incompatible with Vision Zero as I understand it. I’m not sure why you’re stuck on the false dichotomy. It’s a fallacious argument type (see http://www.unc.edu/depts/wcweb/handouts/fallacies.html for this and others) As a society we have a large amount of resources available; acting as if those devoted to transportation are zero-sum with those devoted to healthcare is just nonsense, especially considering the point I made that fewer transportation injuries (and an environment more friendly to all road users) means reduced healthcare costs. Alexis, I may have confused the issue by using healthcare as my example of an alternative way to spend money. Whether bicycle use helps or hurts public health (I think we can all agree it does) is irrelevant to whether Vision Zero offers a good way to prioritize transportation improvement. Seems pretty clear-cut. The paper’s analyses start with the assumption that road deaths can be brought to zero. … except that if I were choosing the yardstick, I wouldn’t even choose mortality. I’d choose happiness. By the way, I’m glad to get this argument over with. (At the cost of staying up late!) It’s been my private reaction to Vision Zero for two years or something. I’m hip-deep in these opinions, so I’m glad to have to look around. The Vision Zero website itself actually notes that mobility has increased in Sweden, although they don’t provide support for it on the site other than showing that traffic increases as road deaths go down. This is another example of a potential false dichotomy: mobility or safety? What about mobility and safety? There are a lot of comments here assuming that’s not possible, but I’m not aware of any compelling evidence that it’s impossible. I do want to reiterate that it’s Mayor Adams who was using the “safety is our #1 priority” language. I’m saying it’s not currently, and asking whether we are ready for it to be. Shifting to safety as our #1 priority requires more than just saying it is. It would be a huge shift in our approach to roadway design, funding, etc. It’s obvious that it’s a huge shift from the comments here — some people don’t accept the idea that (soma/any/all) road deaths are preventable, others immediately think that they are only preventable with ridiculous prevention measures (that seems to be where you are), and others are highly reliant on the idea of personal responsibility to prevent crashes, without considering some or all of the effects of the system on individual behavior. My personal view on Vision Zero is still evolving. I love the concept of shifting responsibility to system design (acknowledging human fallibility) and I find the idea that death and serious injury as a result of transportation are completely unnecessary very appealing. The completely-unnecessary part may address the dishwasher-type argument you were making above. It’s not necessary for anyone to have issues with knives in the dishwasher. Some people do anyway, because they do something so dumb/dangerous that the generally sound engineering of the system can’t help them. We can decide how much we want to help with that, but we all agree that no one needs to, or ought to, die because of a knife in the dishwasher. It’s considered a freak accident that only happens in rare circumstances. If we got to that point with traffic deaths, I think that would be pretty awesome. I would suggest a little humility on your part. Did you even read the study? Did you understand it? @Michael – we certainly shouldn’t ban dishwashers, but warning stickers are certainly warranted and so is better engineering that could prevent people from being able to leave knives in an unsafe position. I guess to me it’s annoying that the bar set for engineering in this country is so low. If safety was a serious consideration across the board (together with things like end-of-life reuse, etc.) we would see quality of life in this country skyrocket again. nothing will change until we reclaim our city government. My feelings about the mayor are well known. We need Amanda Fritz to stay on and AT LEAST two other real people to win commissioner seats in order to get any real safety. any volunteers? all you need is 1000 friends to give $5 each and you can get city funding. there is simply no excuse to be “lead” by “men” like the current Mayor. Unfortunately, voter owned elections were voted down last November, so you don’t just need 1000 people at $5 a piece. There’s no city funding for election campaigns any more. It’s back to the traditional fundraising structure, which usually means a fair number of $500-$2500 checks from some city heavy hitters, along with a host of smaller checks from others, and some funding from PACs. The only way to prevent transportation-related fatalities is for everyone to stay home. The airline industry has achieved near-zero fatalities by rigorous and expensive inspection, licensing, and control of every aspect of flying. That suggests a way to get to the same point with ground transportation. Require yearly drivers’ tests, fence off all roads and streets from pedestrians, place signal-operated gates on all crosswalks, and employ lots of police to monitor all aspects of driving, walking, and biking. If we are not going to do that, let’s admit that safety is not and should not be our top priority. Too much safety is not compatible with freedom. I think a big factor in this safety talk is the automobile itself. The tools are out there to make the car safer, equipped with sensors that can react to stop the vehicle far faster than a human can. Sensors that know when a driver becomes distracted and takes his eyes away for a protracted amount of time. Sensors that will not allow the vehicle to go faster than the posted speed. It will be difficult to make every street in the country (or world) designed safe enough, but the vehicle can be greatly improved. Too bad our political leaders have no balls to require these things from car manufacturers, unless we make them. For the last 80 years, the ped or bike is assumed at fault in a crash unless proved otherwise. It’s a freakish twist of logic to automatically put the blame on the entity with the lowest amount of kinetic energy. Drivers are not expected to consider that there may be an escapee from the alzenheimers unit in the middle of the road, and no citation would be issued when the driver smashes into them. It would be very different if motorists can be assumed to be at fault unless proven otherwise. If the driver could actually be held responsible for the mayhem caused by careless driving, it just would not happen as much. This kind of shift in the social construct is not likely to happen soon, but it is worth fighting for. How do we fact check this? I am having a hard time believing it is that bad. I mean that is insane. I would have never ever guessed it is that dangerous. We are truly complacent and safety is not number 1, If that is true and we don’t have an action plan to resolve it. Kevn – it looks like my link to the 82nd Ave study got lost originally. I posted the link to the PDF on the City website in one of my comments above. Do check my math, though I don’t think I miscalculated – I was appalled as well. Also, be aware the data is 1997 through 2006, and there has been an overall decline in recent years. To me, this sounds like failure to understand the source of danger on the roadways. The roads are completely safe by themselves. It’s the addition of cars and other speeding motor vehicles that makes them unsafe. So no, they are not well covered, they are still killing people every day on the roads of this country. You can’t expect infrastructure and equipment to compensate 100% for risky behavior on the part of riders, nor should we pay exorbitant amounts in the futile attempt to do so, as others have noted above. It does no good having a stop sign at Flint and Broadway (a clearly marked and understood safety measure) when riders blithely ride through it right into Broadway traffic. I’ve personally witnessed at least two crack-ups right at that location, where the vehicle had the right of way. I’m by no means saying the system can’t be improved but the rider has to take ownership of their safety too. Let’s not pretend all problems are because we’re not spending enough money. if the motor vehicle is not turning right onto wheeler or ross, there is usually room for a cyclist coming off of flint to make the turn into what is, after all, a striped bike lane. not saying i would ever do this, but the logic is not entirely absent. the crackups maybe come from motor vehicles not signaling the right turn. but since i pretty much expect motorists not to signal turns i do stop there and wait for cross traffic to clear entirely from the right travel lane. and then i claim the travel lane all the way down to larrabee.